I had a request for a Nativity display the other day in the Shout message board. I designed this one yesterday and cut it out tonight. The figures are 4 to 5 inches tall. The base is 18 inches long and 10 inches deep. I cut the figures from Peruvian walnut. The base and manger are oak. I wish I had used more contrasting woods for this project. The Peruvian walnut and oak are too similar colored for the figures to stand out. I should have used walnut for the figures. 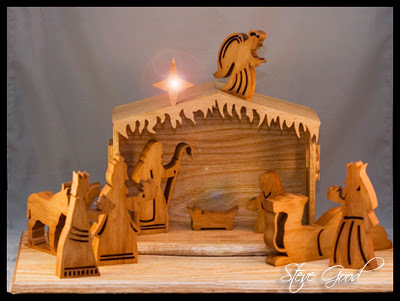 I know it is getting a little late to start on Christmas projects but this Nativity display can easily be finished in an afternoon or two. If you decide to try this project send me a picture. I would love to see what you guys can do with this one.